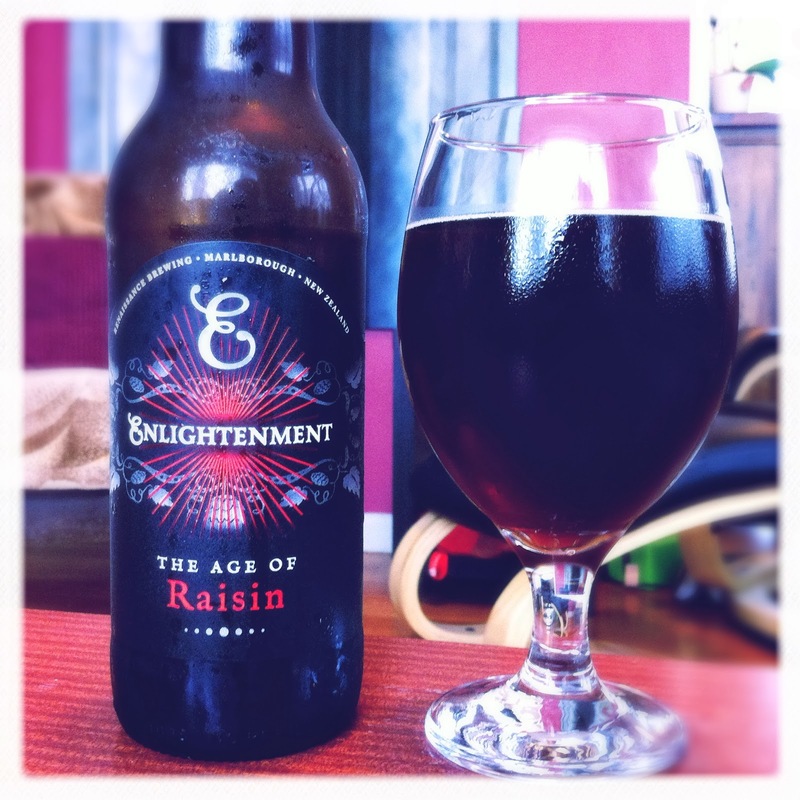 Here's a smart little offering from Enlightenment Brewing. The age of Raisin. It certainly smells like raisins, and a bit like walking through the back rooms on a winery tour when the guide decides to go off plan.The malt aroma's are lovely. I guess I'm used to malt aroma's hiding shyly behind the hop aroma but in this beer I get a fresh cake smell, a golden syrup sultana cake thats maybe gone a little crispy round the edges. Great deep colour, loads of red in there which is occasionally highlighted in the dismal spring light of this rainy day. Little to no head and sparse carbonation but upon drinking its more lively in the mouth than in the glass. First impressions are definitely raisins, but with a balancing acidity. I'm actually reminded of Fuller's ESB. Just that hint of winey raisins. But this beer has a little more acidity and it finishes smooth on delicious biscuity malts with a very slight, oh so slight, hint of butter. Its like drinking toasted sultana bread. Hints of caramel and toffee sugar delight me. I really like the mouth feel of this beer. It starts zingy and finishes nice and round. The belgian yeast adds a little spice, which just makes itself known on the finish merging with the heat of the alcohol. Once again an excellent beer that I can imagine pairing with food, a creme brûlée with its caramelised sugar would be excellent here, or I think it has enough flavour to hold up to a sweet gamey meat dish like duck or even venison.